Protecting your income – Passenger Cancellation Compensation! We know it’s frustrating when you’re driving towards a pick-up location, and all of a sudden, the trip gets cancelled. As part of our efforts to make your Grab experience better, we’re introducing a new goodwill policy effective 10 September 2018, which will protect your income in such situations! It’s simple. If you accept a job, and the passenger cancels at least 5 mins after you have accepted the job, you’ll receive $4 to help cover the time and petrol you’ve spent! As of now, the $4 will be credited to your cash wallet by Monday, 11.59pm every week. However, we’re working to have the compensation automatically credited after a cancellation. Stay tuned! Q: Why are only trips that are cancelled at least 5 minutes after acceptance eligible for the compensation? A: The 5 minutes are a grace period for passengers to cancel. If they take longer than that, you’ll receive the compensation. Q: I was caught in a jam, and the passenger cancelled after 10 mins, do I get more? A: No, the compensation is currently capped at a $4 flat fee. Q: Will I receive the compensation if I’m already there, and the passenger cancels? A: Yes! As long as the passenger cancels at least 5 mins after you’ve accepted the job, you’ll receive the compensation! Q: How will I receive the compensation? A: While it was credited weekly previously, effective 1st October 2018 the compensation will be instantly credited to your cash wallets. Q: Who’s paying for the cancellation compensation? 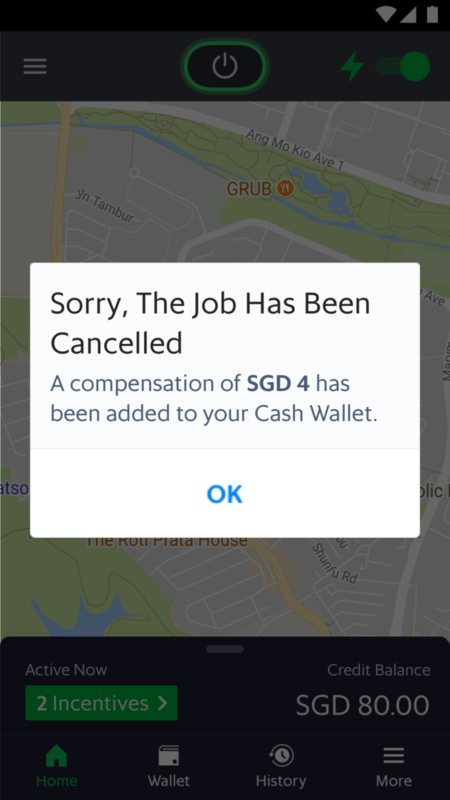 A: As of now, the cancellation compensation that you get comes from Grab!